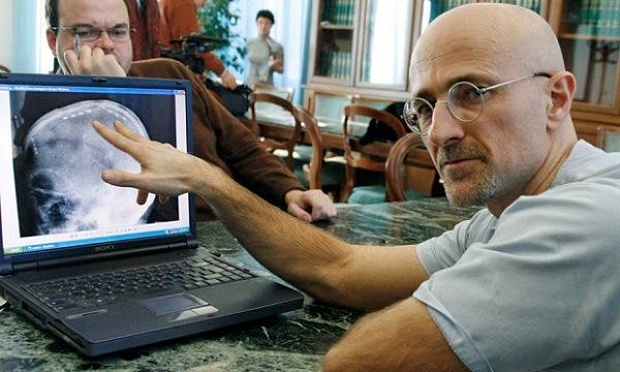 The Real Life Frankenstein: Surgeon promising first human head transplant makes pitch to US doctors..
On Friday afternoon at the Westin Hotel in Annapolis, Maryland, with the volunteer for the first human head transplant by his side, Dr Sergio Canavero made a bid to recruit surgeons willing to help him perform the procedure from an audience of fellow doctors at the annual meeting of the American Academy of Neurological and Orthopaedic Surgeons. The topic of Canavero’s keynote was a procedure he hopes to perform in the next 24 months, which he calls HEad Anatomosis VENture, or “Heaven”. “Today I’m here to give us all a vision,” Canavero said. The physician added that there was no such thing as the self, and that the final goal of his project was life extension. For two and a half hours (the presentation was scheduled for 90 minutes) in front of an audience of mostly blue- and gray-suited middle-aged surgeons, Canavero paced the width of the long room in cream slacks and a reddish-brown tunic, bespectacled, his head shaved, looking like an especially hip monk. He spent most of the first half-hour firing off aphorism after aphorism, some by writers including Kierkegaard and Arthur C Clarke, others of his own devising. “If Heaven is reckless, nature is crazier, and nature must be given pause when it comes to what it does to us all as creatures on this planet,”he said. The neurosurgeon, of Italy’s Turin Advanced Neuromodulation Group, veered between trying to inspire his listeners, digging deep into neurobiology and goading the white-haired medical professionals assembled in front of him. At one point he compared the procedure’s future success to the moon landing, with an image of JFK on the screen behind him. “We must go to the moon to test who we are, to test our skills, to test our confidence, to see what kind of men we are!” he said. He has said he plans to perform the procedure either in the US or China. Humility was not a quality the audience seemed to sense in Canavero. “Ask him yourself,” Canavero replied. Valery Spiridonov, the man who has volunteered to undergo the procedure, spoke little at the gathering, but he was figure of great interest. 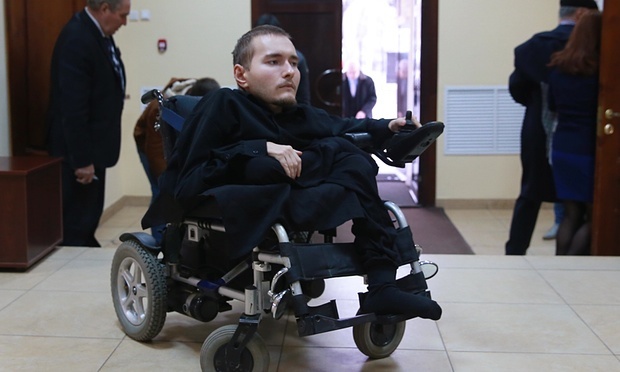 Spiridonov has Werdnig-Hoffmann disease, or spinal muscular atrophy. It’s a debilitating, eventually fatal condition that had taken a visible toll on the 30-year-old Russian’s body. Spiridonov emailed Canavero out of the blue when the doctor’s project began to receive press attention. “I believe my body is just mechanics that I want to have removed,” he said. He spoke of having to hire people to help him from his position in a small wheelchair next to the stage. Other doctors, said Canavero, have questioned whether or not the high rejection rate of radical organ and limb transplants might mean that a full-body transplant patient might go out of his mind. Canavero told them to imagine themselves in Spiridonov’s place. “Would you believe that your condition could drive you to insanity, to madness?” he asked Spiridonov. What about the anterior spinal artery? The other question, of course, is whether or not the operation is possible. 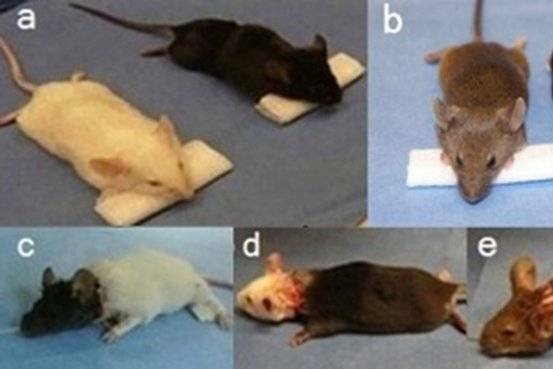 Canavero pointed to head transplants in mice successfully performed in China, and said that polyethylene glycol (PEG) – which is often used as a laxative, but has been found to have applications for spinal injury patients – could essentially glue the motor centers of the spinal cord back together successfully after they had been severed. One doctor interrupted Canavero in the middle of his lecture to point out that, as a vascular surgeon, he was concerned about, among others, the anterior spinal artery. “You’re gonna cut right through that,” he said. Canavero invited him to join his working group, saying he had done his part and now it was time for them to step up. The doctors were divided on whether or not to perform the procedure at all. Is a head transplant ethical? Tuazon attended the conference with Edith Tuazon, a nurse and his wife of 44 years. She was unconvinced.